Another film by Modern Romance. Since it's a "shootout", we wanted to create a little video of a shootout... with cameras and with a little bit or humor of course. Dan and Jordan with no doubts were the best candidates for the job! Dan known as the hat lover, happened to have a cowboy hat with him that day! Jordan being the "groom" model in his nice suits and all, it was the best combination for the "cowboy vs agent" action! We had the pleasure to work with great vendors and sponsors including Film 2 Frame Studios, Garden Party Flowers, Anita Lee Makeup + Hair, Blurb Books, Lowepro, Zin Frames, Vancity Bride Blog, and Vancity Wedding Directory, And not to mention this successful event was hosted by our fellow friends from Stone Photo, Butter Studios, and Pure White Studios. Be sure to watch till the very end of the video to see more actions, credits, and... you'll see! 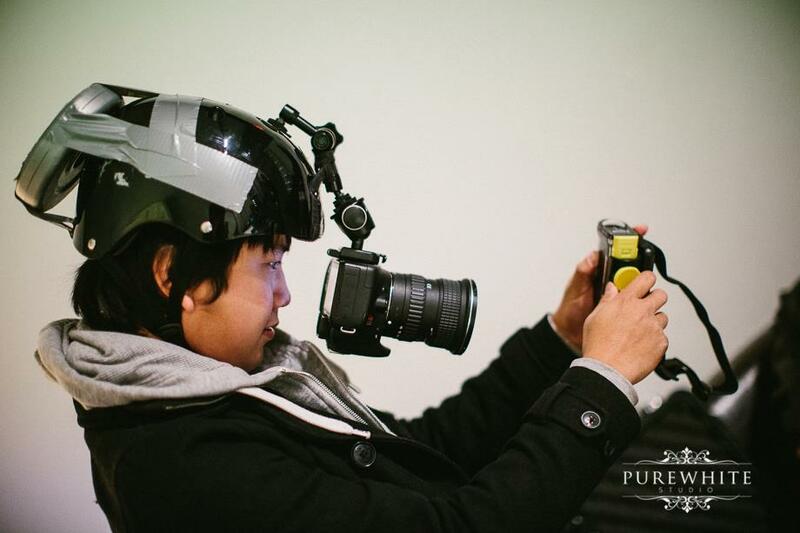 here's our master mind behind all the actions and the infamous helmet camera... home made!